- NRTL typically, even in primaries, opposes pro-life candidates in favor of pro-abortion candidates "who can win"
Sources below, many of them primary, document the shocking and horrific fall from grace of the National RTL Committee (aka NRLC). Dred Scott Shepardized Exposes Flawed NRTL Strategy: National RTL has staked its strategy for victory on getting the U.S. Supreme Court to show humility by reversing its own illegitimate ruling that has led to the killing of 55 million children. For in assessing how "to undo the Supreme Court's miscarriage of justice," Wanda Franz wrote that compared to any other alternative, "It is more promising to pursue the route of the court reversing itself on abortion." However 150 years of legal history shows that judicial pride will render that strategy a failure. Since their 1857 pro-slavery decision claiming that black men could be owned as property, the Supreme Court has mentioned Dred Scott 56 times, and what they have said should inform pro-life strategy. American RTL commissioned a Shepardization3 of the Dred Scott opinion analyzing the court's subsequent references to that case. Both Roe v. Wade and Dred Scott falsely present living human beings as property, and not as persons with full human rights. The Supreme Court has been mostly neutral or even positive in its references to its own illegitimate Dred Scott decision. 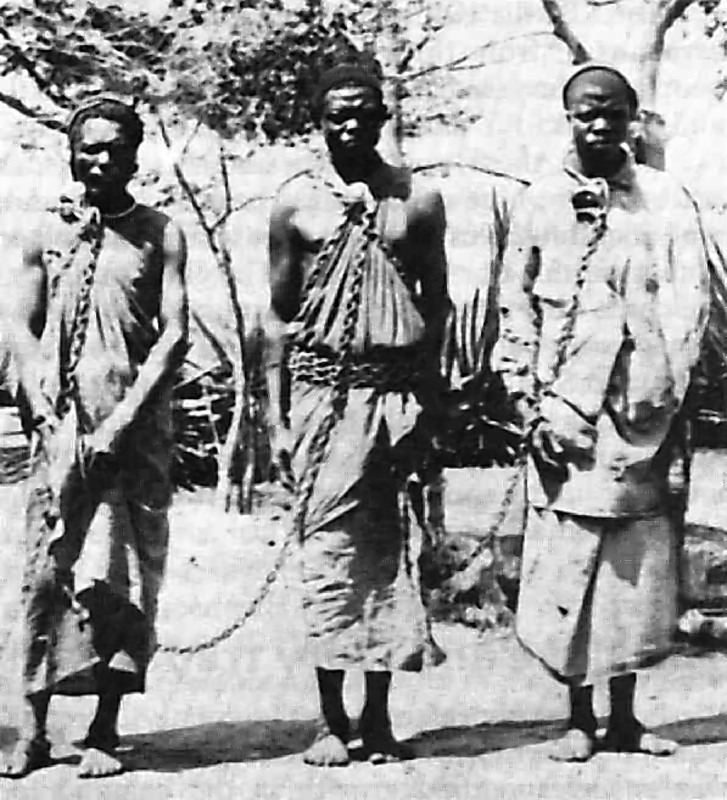 So after a war, a constitutional amendment, and abolition, the Supreme Court still has not acknowledged its illegitimacy for denying full personhood rights of black slaves and thereby reinforcing America's intensely wicked kidnapping-based4 slavery. Then, virtually guaranteeing failure by NRTL's strategy, the 'pro-life' presidents and candidates they defend openly claim and demonstrate that they ignore abortion when nominating judges for life terms. Considering these factors, the court might not reverse itself for centuries, if ever. Abolitionist William Wilberforce would never have opposed those fighting for abolition and he urged the U.S. to fight to end, rather than to regulate, slavery. It’s never the wrong time to do the right thing. Even if this misguided reverse-Roe strategy is followed for 150 years, institutional pride will likely prevent the court from ever admitting and reversing its own crimes against humanity. Unauthorized Recording from Nat'l RTL's Annual Meeting: A CRTL representative testifies just prior to the National RTL vote to disenfranchise their Colorado Right To Life state affiliate. Their spokesperson rebukes the pro-life industry for 15 years of fraudulent fundraising that raised a quarter-of-a-billion dollars for a PBA "ban" that, as Dr. Dobson wrote, "does not save a single human life." CRTL also reprimanded NRTL for regulating child killing and for their roll in filling the courts with pro-abortion Republican judges. Founder of Abolish Human Abortion Confronts Nat'l RTL VP: In the Oklahoma capitol building National Right To Life's vice president Tony Lauinger meets AHA's T. Russell Hunter and other abolitionists. The extraordinary battle in Oklahoma City over Senate Bill 1118, supported by 22 state senators and opposed by National Right To Life, which would have ended all state-sanctioned child killing by acknowledging that abortion is murder. 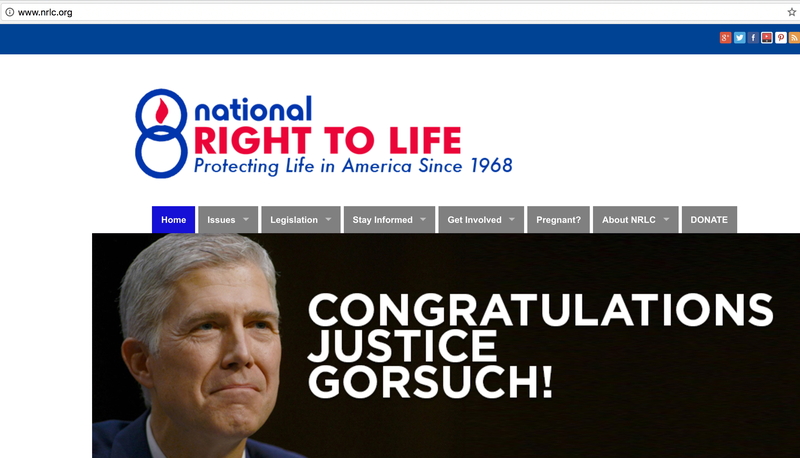 NRTL Is Offered $10,000 to Name One Pro-Life Justice: See this offer also at Yahoo News, Denver Post, Covenant News, Houston Chronicle, CNBC, etc. 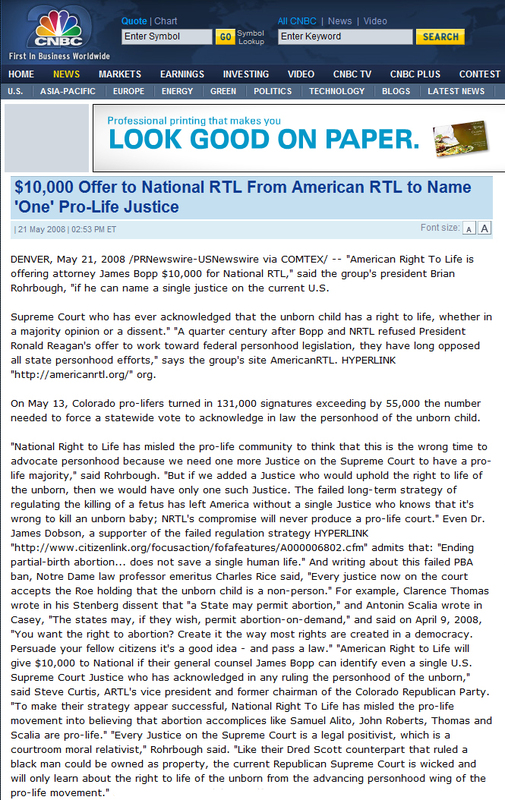 To demonstrate the failure of National RTL's legal strategy, American RTL is offering them $10,0005 if their president Wanda Franz can name a single Justice sitting on the U.S. Supreme Court who has ever acknowledged, even in a dissenting opinion, that the unborn child has a right to life." But isn't Antonin Scalia pro-life? Regarding a law that would recognize the baby's God-given right to life, Scalia, the Justice most often claimed as pro-life, has said, "I will... strike down a law that is the opposite of Roe v. Wade... One wants no state to be able to prohibit abortion and the other one wants every state to have to prohibit abortion, and they're both wrong..."6 In 2004 Scalia claimed, "Take the abortion issue... there's something to be said for both sides. "7 And on April 9, 2008 Scalia said, "You want the right to abortion? Create it the way most rights are created in a democracy. Persuade your fellow citizens it's a good idea - and pass a law." NRLC's Massive Conflict of Interest: Typically, lobbying groups attempt to influence public policy by giving money to political parties. Following the money, when researchers at ProlifeProfiles saw certain GOP/NRTL transactions8, they knew they had one of the motives behind the pro-life sell-out to partisan politics. In a reversal of roles, NRTL seeks funds from the RNC9 and the Republican National Committee has given money to the Nat'l RTL Committee. In one documented case during the presidency of Wanda Franz, which office she took in 199110, the RNC gave $650,000 to NRTL11 12. (RNC spokesman and former Rocky Mountain News editor Clifford May claimed, as would any disingenuous partisan, that these funds did not indicate any particular party's influence over NRTL, whereas the American Defense Institute returned to the RNC a similar "controversial" donation.) Bloated salaries13, excessive payments to NRTL attorneys14, and well-funded retirement programs help to explain why NRTL promotes tactics that translate well into long-term fundraisers. NRTL's PBA ban fiasco15, for example, was a cash cow that raised a quarter of a billion dollars16 for the pro-life industry. In addition, as revealed by an admittedly partisan U.S. Senate investigation, an RNC Director and a Finance Director tried to shield the identities of political donors by collecting funds payable to NRTL and giving at least an additional $100,00017 from such efforts to NRTL, which organization has betrayed its own namesake by inexplicably supporting many outright "pro-choice" politicians and at the same time opposing all efforts to legally enforce the child's "right to life." And whereas pro-life critics would refer to NRLC as the National Republican Life Committee, in actuality, for a time they conducted their partisan activity openly under the name National Republican Pro-Life Committee. NRTL's Role in Bringing About Obamacare: Just as National RTL supported Arlen Specter who, predictably, was the deciding U.S. Senator who switched parties to pass Obamacare (see below), likewise, National Right To Life supported confirmation of pro-abortion Justice John Roberts who, predictably, cast the deciding vote to uphold Obamacare. Many pro-lifers prefer maintaining the illusion that they are electing pro-lifers over the reality of knowing the truth and thereby having a hope of actually ending abortion. Those preferring the illusion can stop reading here; for all the rest, please read on. NRTL Doesn't Need "One More" Justice: They need five. To get a pro-life majority on the U.S. Supreme Court we need, not one, but five more Justices. More than thirty years of NRTL's influence leaves America without a single pro-life Justice, suggesting a timeframe of centuries before NRTL's strategy might succeed, if ever. When NRTL opposes Personhood efforts saying that, "This is not the right time," because of the make-up of the court, they are effectively admitting their 30 years of failure. After NRTL's decades of "leadership," Notre Dame Law School's professor emeritus Charles Rice wrote, "Every justice now on the court accepts the Roe holding that the unborn child is a non-person... The situation remains as described by Justice John Paul Stevens in Planned Parenthood v. Casey." For Stevens had written that "the Court... rejected, the argument ‘that the fetus is a "person"'. ... there was no dissent..." And Clarence Thomas wrote in his Stenberg dissent that "a State may permit abortion," and Antonin Scalia wrote in Casey, "The states may, if they wish, permit abortion-on-demand..."
National RTL Hides Republican Complicity: Roe v. Wade is a Republican ruling. In 1973 the court had six Republican Justices. The author of Roe v. Wade was a Republican Justice, Harry Blackmun,18 and of the six Republican justices then on the court, five of them voted with the majority for Roe.19 By the end of George W. Bush's second term, sixty percent of the federal judges had been nominated by Republican presidents.20 Yet all those Republican judges helped make up the overwhelmingly pro-abortion attitude of the federal judiciary. And still, the U.S. Supreme Court, with seven of its nine Justices appointed by Republican presidents, continued to illegitimately promote abortion nationwide.21 And Barack Obama's pro-abortion nominee, Sonia Sotomayor, is of course the fruit of President George H. W. Bush's presidency, as he is the one who nominated her to the federal bench.22 Before Roe v. Wade, 19 states had decriminalized abortion to varying degrees, and in 1967 the Republican governors in Colorado and California signed abortion laws that opened the floodgates of child killing.23 24 Not only is NRTL's strategy a failure, it is an insult to millions of Republicans who would rather hear the hard truth, and deal with it, than be lied to while their party slides further into godless liberalism. 40 Years Out from Roe & Dred: It's been nearly four decades since Roe, and throughout the forty years after Dred Scott, even after slavery had been banned not by the court's humility, but by amendment in 1865, the court's lack of humility was summed up in an 1896 case that referenced their pro-slavery ruling, in Plessy v. Ferguson, when it upheld a Louisiana law that required Plessy, who had 1/8 colored blood, to sit in the black section of a train. Likewise, forty years after Roe, not a single Justice, including all those nominated with NRTL's support, has ever acknowledged, in a majority opinion or even a dissent, the unborn child's right to life. 100 Years Out – Skinner v. Oklahoma: Skinner v. Oklahoma summed up the U.S. Supreme Court's lack of repentance through the first half of the 20th century. The court continued its legal maneuvers and appeal to process in order to defend its own blatant injustice, including its ruling in favor of forced sterilization laws. Regarding America's crime against humanity with our forced sterilization of over 60,000 people25, including prisoners, in 1942 the U.S. Supreme Court absurdly ruled in Skinner v. Oklahoma that the equal protection clause of the constitution would not be violated as long as forced sterilization of prisoners included white-collar criminals26. Pinning hopes for victory on the humility and wisdom of the Supreme Court remains naive. 150 Years Out – Planned Parenthood v. Casey: In the century and a half since their illegitimate Dred Scott ruling, their Planned Parenthood of Southeastern Pennsylvania v. Casey argues that some decisions need to be overturned because public opinion demands it (ignoring of course, as it does, the basic principles of justice and morality). The court continues, although lightly, to defend its wicked opinion in Plessy v. Ferguson, that states can treat people differently based on how much black blood they have. Perhaps the majority thought they were protecting their institution's reputation by pointing out that Plessy expressed prevailing public opinion. For as they wrote in 1992, years earlier, "Society’s understanding… was… the basis claimed for the decision in 1896." In other words, Plessy was not illegitimate because that's the way people thought back then. In Casey the Justices actually invite Americans to rise up in a Personhood movement27 to force the court's hand to protect children. The moral of the story, told over a century and a half of Supreme Court rulings that reference its own Dred Scott, is that NRTL's strategy based on the Supreme Court recognizing as illegitimate and reversing its own ruling against millions of children is historically and politically uninformed. - pro-abortion Heather Wilson whose own staff referred to her as "pro-choice"
- Chris Baily whom Bob Novak described as "about as pro-life as Ted Kennedy", who had recently said on TV, ""I am personally opposed to abortion [but] I do not believe that my views should be imposed on other people", and who years earlier had supported liberalizing Oregon's abortion law. out of misguided calculations, then so can the church-going masses. Instead, America needs pro-life organizations that show principled leadership and demonstrate that no person who knows right from wrong should support any candidate who would intentionally kill even a single innocent child. No one but God knows what kind of America we would be enjoying today if "pro-life" leadership in America had committed, above all else, to honor God's enduring command, Do not murder. Anatomy of a NRTL State Chapter Candidate — Bart Stupak: Right To Life of Michigan is a good example of state chapters who, with NRTL's complicity, endorse politicians who promote exceptions, and worse. Remember that an "exception", which is a euphemism for a child intentionally killed, is a window to the soul. NRTL's Michigan chapter has long endorsed candidates like Dale Kildee and Bart Stupak. And since "exceptions" are a window to the soul, it was not a surprise to astute pro-lifers but an expectation that Bart Stupak would betray children and the pro-life movement by voting for Barack Obama's largely socialist health care reform. (ObamaCare is rather similar to Mitt Romney's health care reform41 by which NRTL friend Romney authorized funding for even late-term abortion on demand). Stupak of course voted for Obama's health care takeover on the "assurance" that Obama would prevent the very abortion funding that was IN THE LAW THAT STUPAK VOTED FOR. It didn't take long for the president to allocate $160 million dollars42 43 to Pennsylvania, authorized by ObamaCare, to establish a fund that pays for abortion. Making excuses to support immoral laws and leaders who advocate killing some kids causes people also to become politically naive. Even in Primary Elections, NRTL Supports Pro-Abortion Candidates: NRTL has long played both sides and opposed pro-life candidates in favor of pro-abortion candidates "who can win", even when those pro-abortion candidates will very likely lose. Local reports with headlines like "NRTL PAC deals death blow to San Diego Pro-life Movement..."44 endorsing pro-abortion Brian Bilbray and giving him "political cover"45 In one widely-reported example of their political sell-out46, NRTL made it clear that they approve of endorsements even of an outright pro-abortion candidate like Rudy Giuliani, even during a primary. NRTL Endorsed Federal Acceptance of Assisted Suicide Laws: As documented in an interview with Bobby Schindler, NRTL committed perhaps the most immoral act of all during the Terri battle, by introducing the Incapacitated Persons Legal Protection Act which would have been the first federal law to legitimize state assisted suicide laws that permitted “the withdrawal of food or fluids” simply with “a written advance directive valid under applicable law. "47 If the Hemlock Society had lobbied the federal government to abide by state pro-suicide laws, pro-lifers would have protested. But in the immoral fog of compromised 'pro-life' strategy, NRTL misled "conservatives" like Dennis Prager, Michael Medved, and Hugh Hewitt, to actually endorse assisted suicide by calling for "written directives" before starving someone to death.48 A world in which 'pro-life' leaders could so easily switch sides and call for recognition of suicide laws was not a safe world for the vulnerable Terri. Not Counting Those Trump Would Save: You can modify ARTL’s Exceptions Calculator. So if you disagree with Trump’s horrific body count, just click over to prolifeprofiles.com/trump#calculator and check on or off the policies that you acknowledge that Trump holds, and change the U.S. abortion statistics if you think you have more accurate numbers. Then see for yourself how much blood is on the hands of National Right To Life leaders for their dereliction of duty. Not counting the children killed under laws and court opinions that Donald J. Trump disagrees with, but only counting those whom he affirmatively stands for the right to kill intentionally, and those whom he says he has made manifest that he will make no effort to protect by law, the total number of actual young boys and girls in America whom President Donald Trump will support killing in his four year term is 3,343,452. NRTL Did Not Warn Christians of the Pro-Abortion Policies of George W. Bush: NRTL did not educate Christians about president Bush's repeated campaign promise that he would ignore abortion when nominating Supreme Court Justices. Instead, NRTL endorsed Bush and called him "a great pro-life president. "52 Yet by his own policies, while President, George W. Bush supported killing, by abortifacients and surgical abortion, 3,340,600 unborn children.53 Not counting those whom Bush would save who were aborted under laws and court opinions that he disagrees with, but only counting those whom he affirmatively fights for the right to kill, and those he refuses to make any effort to protect by law, the total number of actual young boys and girls in America whom George W. Bush supported killing is more than three million children. Further, NRTL did not fulfill their duty to inform Christians of the many pro-abortion policies of George W. Bush54 including that his judges voted to starve to death Terri Schiavo; that he and his two pro-life predecessors nominated a majority of the federal judiciary which is overwhelmingly pro-choice; that although a consummate compromiser he refused to support South Dakota's 2006 abortion ban; that he kept his promise to not oppose RU-486, the chemical weapon designed to kill unborn children; that he was the first president to actually fund embryonic stem cell research; that he believes not every child should be protected by love and by law; that he supports the very position that started the abortion holocaust, that children of rapists can be killed; that he wanted to nominate pro-abortion Alberto Gonzales to the Supreme Court; that he hurt the Republican party by permitting only pro-abortion prime time convention speakers in 2004; and that he gave hundreds of millions of dollars more to Planned Parenthood than even Bill Clinton ever did. NRTL helped cover-up this horrific George W. Bush abortion legacy. NRTL Has Not Warned Sarah Palin About her Pro-Abortion Actions: In 2009 Sarah Palin appointed pro-abortion Planned Parenthood board member Morgan Christen to the Alaska Supreme Court and praised the "wisdom and character" of Judge Christen who will be "an outstanding Supreme Court justice." NRTL has not informed Christians about Sarah Palin's shocking abortion record55 including that she indicates that chemical abortifacients that kill the youngest children should be legal; that she distinguishes between her "personal" and public pro-life views (personally pro-life means officially pro-choice) in that she never actually calls for abortion to be made illegal; that she indicates support for public funding to kill some unborn children; that she whitewashes other candidates misleading millions to believe that pro-choice politicians are pro-life; that she allows her name to be used in ads promoting grisly government-funded embryonic stem cell research; that she undermines the God-given right to life by promoting evolution while officially opposing creation; that she harms personhood by holding that "equal protection" should not apply to unborn children; that she has never announced support for any state's personhood amendment nor the Federal Human Personhood Amendment; and that she actually opposes personhood by claiming that the majority can decide to legalize the killing of children. When NRTL writes glowingly56 of Sarah Palin, while misrepresenting her to their supporters, NRTL is not meeting its obligation to be truthful to the public and to the Body of Christ. Wanda Franz is also acting carelessly toward Sarah Palin as a human being, as though she does not care about Palin's integrity and her standing before God. NRTL Doubled-Down in the 2008 Election: NRTL's endorsement57 of Fred Thompson made them the only advocacy group in history to support a candidate who uses his national air time to oppose a federal amendment that would give their side victory. A popular longtime pro-life blogger headlined her report, "National Right to Life Endorses Pro-Choice Candidate. "58 Not only did NRTL not criticize Thompson for repeatedly stating that he was against a human life amendment, they downplayed his role in lobbying for the abortion industry. So NRTL endorsed Thompson who is against a human life amendment (personhood), opposed to helping Terri Schiavo, apparently not against early abortions, and who had lobbied for abortion in the 1990s. And that's in the PRIMARY! NRTL Candidate Mitt Romney Funded Late-Term Abortion On Demand: The NRTL Committee supported Mitt Romney who single-handedly imposed homosexual marriage on the state of Massachusetts and authorized elective tax-funded abortion through massive government health care "reform." By these two egregious acts, Mitt Romney has done more to destroy the family and the innocent child than has Hillary Clinton. See also the Pro-life Profile of Mitt Romney. - end with the meaning, "and then you can kill the baby." - Former Alabama Chief Justice Roy Moore publicly apologized for his initial celebration of the U.S. Supreme Court's PBA ruling.70. - Ambassador Alan Keyes signed a full-page open letter to Dr. Dobson describing the court's PBA opinion as a "brutally wicked ruling." Give the Fetus Anesthesia, And Then You Can Kill The Baby: NRTL supports Fetal Pain legislation77 even though giving pain killers to the fetus would actually encourage some mothers to go ahead and get an abortion by convincing them that their baby will not feel pain. And worse, the Unborn Child Pain Awareness Act, which Wanda Franz supports, effectively ends with: "and then you can kill the baby." The Rocky Mountain News reported78 on Denver radio79 between American Right To Life and a Nat'l RTL board member on fetal pain. ARTL readily admitted that such a bill of course might convince some mothers to not abort their children (as they consider the fact that babies feel pain), whereas the Wyoming board member of National RTL refused to similarly admit the downside, that offering anesthesia to the fetus might also soothe the conscience of many other women who then decide to go ahead and abort their children, since now, their baby won't suffer. Further, because the bill endorsed by NRTL only addresses killing babies who are 20 weeks and older, it makes an enormous concession to materialists by falsely80 implying that a baby cannot feel pain until the second trimester. Of course NRTL would never have supported a National Socialist law that stated a Jewish child could be killed only after first being offered anesthesia. Thus their legislative strategy is evidence that abortion so permeates society that even Christian leaders have a hard time remembering that we are talking about killing children. Show Mom an Ultrasound, And Then You Can Kill The Baby: NRTL supported91 Senator Sam Brownback’s well-intentioned Ultrasound Informed Consent bill92 which backfires, as do all abortion regulations. Activists hope that with such regulations women will decide against killing their child after seeing an ultrasound of their baby, very possibly sucking his thumb or playing with her toes, as first-trimester unborn children tend to do. But among conservative, otherwise "pro-life" judges there is a judicial crisis93 94. Thirty years of requests from NRTL for these judges to uphold such child killing regulations have convinced thousands of potentially good judges that the government actually does have the right to regulate the killing of innocent children. In fact, Roe v. Wade itself, which was passed by a Republican majority on the Supreme Court, was really just another abortion regulation, as 19 states had already done to varying degrees, starting in 1966, and Roe does not even recognize any absolute right to abortion, but wrongly claims the same authority that the pro-life industry claims, the supposed right to regulate child killing. As Republican Justice Harry Blackmun wrote in Roe itself, some argue "that the woman’s right is absolute and that she is entitled to terminate her pregnancy at whatever time, in whatever way, and for whatever reason she alone chooses. With this we do not agree." Thus NRTL's success in passing regulations has backfired and made it virtually impossible even for America's "conservative" judges to acknowledge the God-given right to life of the unborn. Regulations Will Keep Abortion Legal: NRTL has never even acknowledged to their contributors that if Roe v. Wade is ever simply overturned (with abortion immorally104 "sent back to the states" which is NRTL's strategy since they don't support the personhood movement), that Informed Consent and many of NRTL's own laws105 will keep abortion legal. Apart from the personhood movement106 107 which NRTL opposes, if Roe is simply overturned, Planned Parenthood will fight to keep NRTL's laws on the books because NRTL's "pro-life" regulations will become the nails that will keep open the abortion clinic doors as abortionists kill millions of babies by the re-authorization for abortion in NRTL's misguided legislation (that implied "right" to abortion that NRTL admitted to108). Apart from the personhood movement, NRTL would then have to go to the public, the media, and governing officials, and argue that they must repeal their own laws, which are keeping abortion as legal as Roe v. Wade did, for they are merely variations of Roe, which itself regulated abortion. NRTL has Not Endorsed any of the 40 State Personhood Efforts: Unlike Tier 1 pro-life leaders and organizations and thousands of pro-family activists around the country, NRTL has never endorsed any of the many109 110 state-level amendment and legislative efforts to move the government to recognize the unborn child's right to life. NRTL has Not Endorsed the Federal Personhood Amendment: Unlike Ronald Reagan who as president offered to support a federal human life amendment, NRTL and Wanda Franz have not endorsed today's version of that effort: American Life League's Federal Human Personhood Amendment.111 Reagan publicly regretted his previous pro-abortion actions.112 NRTL should exhibit the former U.S. President's willingness to acknowledge error. Pro-lifers put themselves into four tiers based upon what they advocate for: personhood now, personhood whenever, personhood later, and personhood never. If Franz and NRTL want to raise their ranking from Tier 3, all they need to do is ask.113 NRTL can contact the research team at ProlifeProfiles and let them know which Tier describes their commitment to the God-given right to life of the unborn. ProlifeProfiles will take Wanda Franz at her word. NRTL Supports Pro-life Violence: Abortionist George Tiller was murdered in 2009 by a pro-life radical (see AmericanRTL.org's powerful and needed Abortion Vigilantism Worksheet).114 When National Right to Life says, "We oppose violence in the name of the pro-life movement" they're lying because they support people like Mitt Romney. They will support someone who says he's pro-life but advocates keeping legal the killing of any number of children, supposedly for the goal of a pro-life victory. That is supporting pro-life violence. And so Christians need to be consistent and be against both the vigilante and the politician who says, "Well, I only want to kill 30,000 kids a year. That's it. That's my limit." NRTL Sins Against Romans 3:8: "And [why] not [say], 'Let us do evil that good may come'? - as we are slanderously reported and as some affirm that we say. Their condemnation is just." (Romans 3:8) When National Right to Life promotes candidates like Mitt Romney and John McCain who are in favor of keeping fewer abortions legal than their Democrat opponents, their goal is to support the lesser of two evils. They are attempting to "do evil that good may come." They are sinning against Romans 3:8. Their view is, "If we can just get enough Christians to sin against God's principles, then God will bless America and outlaw abortion." It's insanity. The Gospels mention a pragmatic political party, the Herodians, the religious leaders who allied themselves with Herod Antipas, thinking that the Herodian dynasty was the lesser evil. With a choice between Herod or Christ, they chose Herod thinking he was the best chance the Jewish worshippers could pragmatically expect in their hopes of attaining to their kingdom on Earth. National Right to Life's moral relativism would defend supporting Herod. But John the Baptist, instead of joining the Herodians, rebuked Herod, and for his courage, this wicked ruler beheaded the man whom Jesus described as the greatest born to women (Mat. 11:11). But how would Jesus describe National Right to Life? NRTL's moral relativism might have led them to campaign for Herod (as they do for Romney) and instead of persecution, Herod might have hired National Right to Life as an apologist for his murderous reign and his hopes for the continued support of Caesar after Antipas built Tiberias (NRTL: "Yes, Herod murdered John the Baptist, but I would still campaign for him"). NRTL is imitating the pragmatic religious leaders, the Herodians. Mat. 22:16,18...the Herodians [said], "Teacher, we know that You are true, and teach the way of God in truth [lip service]...But Jesus perceived their wickedness, and said, "Why do you test Me, you hypocrites?" [also at Mark 12:13] Mark 3:5-6 [Jesus saw] the hardness of their hearts, [and] the Herodians [plotted] against Him, how they might destroy Him. June 2013 Update: The godless Federal Pain Capable Unborn Child Protection Act (HR 1797) was designed by National Right To Life. God said, Do not kill the innocent. He did not say, Don't kill the innocent unless you're sure they're not going to feel pain. Not only does this bill not support the right to life of the unborn, it undermines a belief in a right to life. If this bill passes, any Republican judge who upholds it must first convince himself that he has the authority to say when certain innocent children could be killed and when they cannot be killed. Everyone who believes in the God-given right to life of the unborn should be concerned: that National RTL eagerly supports politicians who have supported the killing of millions of innocent children; that National RTL does not care enough about conservative officials to warn them not to support the killing of the children they call "exceptions"; that National Right To Life's primary abortion strategy is to support immoral child killing regulations which end with, "and then you can kill the baby"; and that Wanda Franz and National RTL undermine the nationwide personhood movement which is fighting for the government to enforce the unborn child's God-given right to life.